The need to prove marketing’s value has been an ongoing battle for pretty much as long as marketing has existed as a discipline. While it is patently obvious to everyone in the marketing department that they’re a major business driver, others don’t always agree. It’s not difficult to see why. While today's B2B marketers can often point at circumstantial links to increased sales, they have struggled to show straight-line causality between their activities and business performance. Of course, the discipline has had a tendency to make its life more complicated by adopting various vanity metrics (likes, shares, retweets etc). While these show some people responding to certain tactics, more often than not, these metrics have no impact on bottom-line revenue. They can also lead to self-fulfilling approaches that simply boost these inconsequential measures even further. Today, B2B marketers are under more pressure than ever to deliver pipeline and revenue, but are they really willing to stand up and be counted on their results? Across the respondents to our Revenue Rift Research, just 37% use marketing-generated pipeline as a key metric. This places it just ahead of ‘social engagement’ metrics at 32% and ROI at 27% but behind tactical measures such as email opens and clicks (40%). And when we asked respondents to name the number one metric in use, while total marketing generated pipeline/revenue came top, this only accounted for 14% of the total. At first blush, this looks as though B2B marketers will struggle in the face of a CEO or CFO asking them to ‘Show me the numbers’. Looking across the various measures in use, we see a range of options that are de facto synonyms for revenue. For example, 45% of respondents track closed:won sales and 42% measure win rate. On the pipeline side of the equation, half the respondents track the number of qualified leads (the most common measure used) and 39% measure net new leads. What this shows is that, while just over a third of B2B marketers are willing to explicitly nail their colours to the revenue mast, a significant number are actively tracking sales-related metrics. The key difference is between those who favour outcome metrics (revenue, closed:won, win rate) and those that err on the side of measures showing an input to sales (qualified leads). B2B sales cycles are long. Beyond entry-level SaaS offerings, it’s not uncommon for sales to take 6 to 12 months or more. This has a significant impact on any B2B marketer tasked with boosting revenue. Whatever they do today will not generally show a return for at least the next two quarters. For many of our respondents, the answer appears to be: yes. Under a quarter (23%) of B2B marketers in the survey measure pipeline velocity (ie the length of the sales cycle). This falls to just a fifth for enterprise marketers. It drops even further for professional services with just 17% using this metric. In fact, only manufacturing businesses get over the 25% mark. To be clear, over half will score leads based on where they are in the buying cycle, they just don’t focus on how fast they’re moving through. For marketers under pressure to deliver revenue, taking targeted actions to accelerate the sales process is one of the most efficient ways of achieving their objectives. Importantly, this is not just about being able to pull revenue from next quarter into this one (though that’s certainly a benefit for quarter-to-quarter B2B organisations). Focusing on pipeline velocity forces marketers to more closely examine each opportunity stage in the sales cycle. This enables them to spot where points of friction exist that not only slow sales but which often lead to opportunities simply vanishing into perpetual ‘no action’ loops (turning into zombie leads that can skew the overall picture of sales and marketing effectiveness). It also helps forge better alignment between sales and marketing as both are required for effective analysis and both directly benefit from targeted action. And, of course, it generates some very specific metrics that are understandable throughout the organisation. It is no longer enough to simply spray-and-pray (whether that's outbound demand generation activity or inbound content marketing). Importantly, however, neither is it desirable to measure anything and everything just because you can. The metrics you select need to be meaningful across the organisation. Ultimately, this means selecting a limited number of measures that have clear business outcomes attached to them. Be clear on the wider revenue targets of the business. Where do these come from? Is there a difference between good revenue and bad revenue? Speak to your CFO. Speak to sales. Avoid ambiguity at all costs. Understand what you need to measure (and what you don’t). Be careful of focusing on metrics that are inputs to sales vs those that demonstrate true business outcomes. Don’t overlook pipeline velocity – not only will it accelerate your results, it’ll help you view the entire revenue picture in a more productive way. The direction of travel in marketing over the last decade is unmistakable. Today’s B2B marketers are now under more pressure than ever before. No surprise there. However, when commentators talk about this, the focus tends to be on the tactical. It’s all the choices and options that cause the stress. It’s navigating an ever-changing marketing landscape that’s the main problem. In reality, the real issue is more fundamental than this. 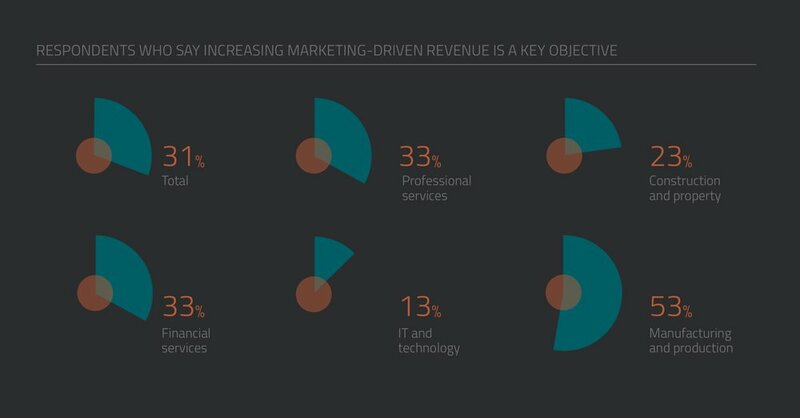 Put in its most brutal terms: B2B marketers are under more pressure than ever before to deliver bottom-line revenue. Sometimes this is couched in terms of pipeline. Sometimes it is about closed:won rates. Sometimes it’s about speed of sales cycle. But the end result is that the C-suite is increasingly looking to marketing to hit numbers that have hard currency attached to them. Of course, we’re all under pressure to deliver, nothing new there. If you want a stress-free life, B2B marketing probably isn’t for you. But, to be clear, for many, the levels of pressure we’re seeing today are intense. In our study, 52% of mid-market and enterprise marketers said they are under a lot of pressure to deliver pipeline and revenue. This increases to 56% when we look just at enterprise marketers. A massive 86% of respondents say the pressure has become worse in the last 12 to 18 months. Just under half (49%) say it’s increased a lot. In fact, split out the responses by sector and the picture is even more stark. Ok, but maybe this is just the new normal. Maybe we’ve hit a steady state and just need to adapt. Maybe, like new tech on the Gartner Hype Cycle, this will all begin to plateau soon. We admire your optimism. Sadly, it’s not shared by those we interviewed. Some 59% of respondents expect the pressure to continue to intensify in the coming year. And you know those professional services and tech marketers we mentioned above? They expect it to intensify the most (70% and 63% respectively). Seriously, if you know a marketer in either of these sectors, stop reading this and go give them a hug. They need it. Given the pressure, it’s no wonder that pipeline and revenue are becoming key objectives for the year ahead. 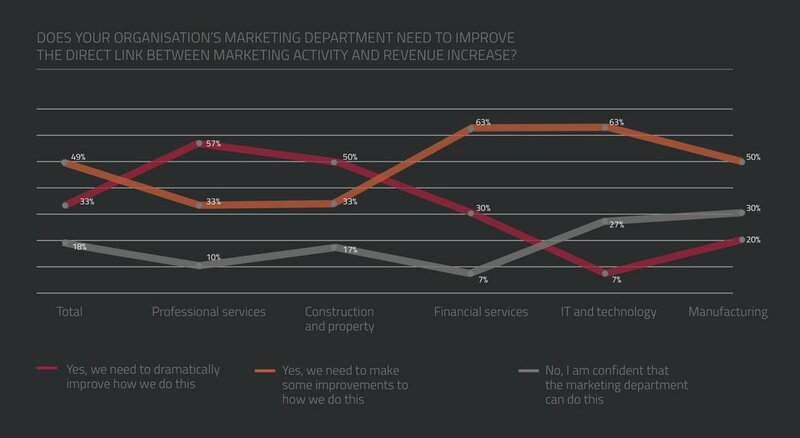 Across our respondents, 31% say increasing marketing-driven revenue is a key marketing priority. Again, the bigger you are, the more you’re feeling the pinch. Among enterprise marketers, we see this number increase to 34%. And it’s not just about professional services and tech marketers. Over half of those in manufacturing businesses are placing revenue in the key priority bucket for the next 12 months too. There is a truism in business that what matters gets measured. Today, with all the talk about data-driven marketing, B2B marketers are measuring more factors than ever before. The survey’s respondents are no different, tracking a wide range of metrics. But when we asked them about the number one metric they are using to measure performance, increasing pipeline/revenue came top (just ahead of closed:won rates). Get on the same page as the C-suite. Understand how marketing fits into the wider strategy of the business. Dig deep to make sure you’re speaking the same language. Even if you’re not feeling the pressure on revenue yet, it’s coming. Start to look at what you’ll need to change if senior management hits you with a significant revenue target. Get ahead of the problem – set your own revenue targets for the year ahead now (even if these stay within the marketing department). Want to get the full report?